All is not well in the Letherii Empire. Rhulad Sengar, the Emperor of a Thousand Deaths, spirals into madness, surrounded by sycophants and agents of his Machiavellian chancellor, while the Letherii secret police conduct a campaign of terror against its own people. The Errant, once a farseeing god, is suddenly blind to the future. Conspiracies seethe throughout the palace, as the empire – driven by the corrupt and self-interested – edges ever-closer to all-out war with the neighbouring kingdoms. The great Edur fleet – its warriors selected from countless peoples – draws ever closer. Amongst them are Karsa Orlong and Icarium Lifestealer – each destined to cross blades with the emperor himself. That yet more blood is to be spilled is inevitable… Against this backdrop, a band of fugitives seek a way out of the empire, but one of them, Fear Sengar must find the soul of Scabandari Bloodeye. It is his hope that it might help halt the Tiste Edur, and so save his brother, the emperor. Yet, travelling with them is Scabandari’s most ancient foe: Silchas Ruin, brother of Anomander Rake. And his motives are anything but certain – for the wounds he carries on his back, made by the blades of Scabandari, are still fresh. Fate decrees that there is to be a reckoning, for such bloodshed cannot go unanswered – and it will be a reckoning on an unimaginable scale (goodreads.com). After reading so many books in a series it becomes more difficult to rate them against each other, but after some consideration I think I am rating Reaper’s Gale at a 3.5. It was still a great book, I just didn’t enjoy it as much as the others.The story really didn’t become interesting for me until the last 150 or so pages when everything started coming together. There were also a bunch of new characters and this late in a series that tends to bother me, especially if they don’t play a role later on or are difficult to tell apart. In this novel there are so many different things going on. The large part of the book was the invasion of Tavore’s army into Lether; there was also Fear and Silchas Ruin and their company who attempt to find the soul of Scabandari Bloodeye. We find out later that Trull and Quick Ben as well as a long lost Bridgburner attempt to find the soul as well. Not to mention Icarium and Karsa who await the duel with the Emperor. I have to say that anything with Trull, Onrack, Quick Ben, Fiddler, and Tehol was pretty interesting. I loved the part of the book where we get to see Tool again, but it was also very upsetting. There is so much going on that I can’t even explain it all here. I believe that if you read the book you will enjoy it, maybe even more than I did. I know everyone has their favorite characters and enjoys their parts of the story more than others just like I do. All of our favorite characters are back in this novel. Quick Ben has to be one of my favorites and there is just so much we still don’t know about him. We do get to see a lot more from him in this book though. His story-line is fantastic! There are also Fiddler and Bottle whom I can’t get enough of either. Even though I hate new characters so late into a series, I really enjoyed Beak, a mage in Tavore’s army. He really leaves a lasting impression and is quite different then the other mages. As always Bugg and Tehol are very entertaining and it wouldn’t have been a book without them! A lot happens with them in this book and it was amazing to find Tehol in the position he was in at the end of the book. Also, Karsa and Samar Dev’s story was great! I love Karsa as a character and his final battle with the Emperor was incredible and just like him! There are TONS of other characters including Toc the Younger, Redmask, and some new ones as well. There are just so many to keep track of it becomes a little overwhelming. At least I know who my favorites are, and hopefully there won’t be so many new characters to keep track of in the next book. The writing and world building in this and all the previous novels is fantastic. The world is huge and we get to see more of it as we read each book and learn more about all these different people. 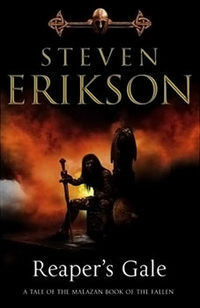 I can’t believe Erikson came up with such a detailed, complex, and complicated world. I thought the book was great, but just not as good as the others. It wasn’t until the final few chapters when I decided I couldn’t put it down. Hopefully, the next book will move a little faster for me. If you are enjoying the series then I highly recommend reading this one; I know you will enjoy it, probably more than I did.